The rover’s percussive drill, mounted on the end of Curiosity’s robotic arm, bored into a target named “Duluth” on May 20. The drill collected a volume of pulverized rock powder using the arm for stability, a new operating mode for the mission’s sampling system. It was the rover’s first collection of a rock powder sample since October 2016. On May 31, the drill dropped off part of the sample into an opening on Curiosity’s science deck leading into the rover’s mineralogy laboratory, named CheMin. Over the weekend, the drill delivered another part of the specimen into the rover’s chemistry instrument, known by the acronym SAM, short for Sample Analysis at Mars. CheMin is designed to beam X-rays at the Martian samples, then measure how the X-rays bounce off the crystal structure of the material. Each mineral diffracts X-rays in a different pattern, allowing the instrument to determine the make-up of the sample, and the role of water in the rock’s formation and evolution. SAM will bake the powder in an oven to several hundred degrees, then analyze the gases coming off the rock specimen. 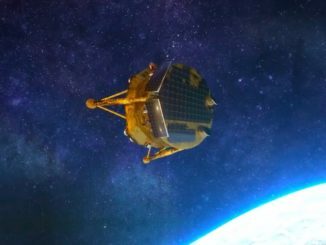 The instrument also contains a laser spectrometer and a mass spectrometer, helping scientists search for compounds containing carbon, a building block of life, and other elements found in organic material. Engineers detected a problem with the drill in December 2016, when an electric motor inside the drill feed mechanism stalled. 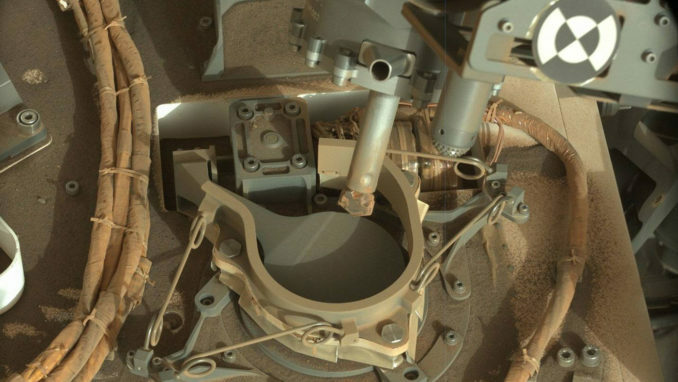 The feed motor is supposed to extend the drill bit to touch the surface of Martian rocks. During the mission’s 15 drilling operations before the motor failure, two fang-like contact posts on each side of the drill bit pressed on the target rock for stability, then the drill feed motor pushed the bit onto the rock. Percussive and rotating mechanisms drive the bit into the target to retrieve a powder sample. With the drill feed mechanism no longer reliably working, managers decided to keep the drill bit in its extended position. That raised concerns over the stability of the drill while in use because the prong-like extensions on each side of the bit will no longer be in contact with the rock. “We had to do a big pivot in the mission thinking about how we could drill without the feed motor,” said Ashwin Vasavada, the Curiosity mission’s project scientist at JPL, in a presentation to the Mars Exploration Program Analysis Group in April. Controllers devised a way to use force applied by the robotic arm to null out forces generated by the drill, a role the arm was never designed to fill. Engineers used a replica of the Curiosity rover at JPL’s “Mars Yard” to test out the new drilling techniques, and the rover drilled a test hole in a rock on Mars in February. That test did not produce a scientifically useful rock sample — it used only the drill’s rotary mechanism, not its hammer-like percussion capability — but yielded important data for engineers to continue refining the updated drilling technique. That was just one step in recovering the drill. Engineers also had to figure out how to deliver sample from the drill to the CheMin and SAM instruments because the mechanism was designed drop the powder into the miniature labs with the drill bit withdrawn, not extended. With the bit permanently extended, a sieving device inside the drill is no longer able to precisely portion out samples for delivery to CheMin and SAM. That device, called the Collection and Handling for In-Situ Martian Rock Analysis (CHIMRA) tool, can only be used with the drill bit retracted, according to NASA. 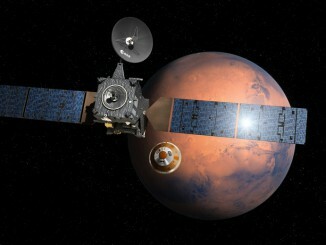 “We had to figure out how to deliver sample material safely to the instruments that has not be sieved and has not been portioned using our typical tools,” Vasavada said in April, as engineers prepared to test out the new techniques on Mars for the first time. The new sample delivery technique, called “feed extended sample transfer,” uses the motion of the drill spinning in the reverse direction, allowing powder to trickle out of the drill and into inlets feeding CheMin and SAM. The instruments need to receive the right amount of sample to properly do their work. 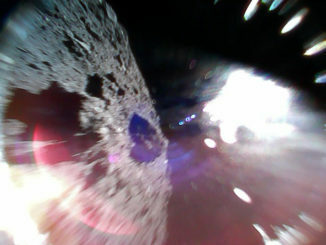 A test of the delivery method May 22 allowed engineers to further refine the technique, NASA said in a statement. Engineers believe a piece of debris wedged inside the drill feed mechanism most likely caused the motor problem. 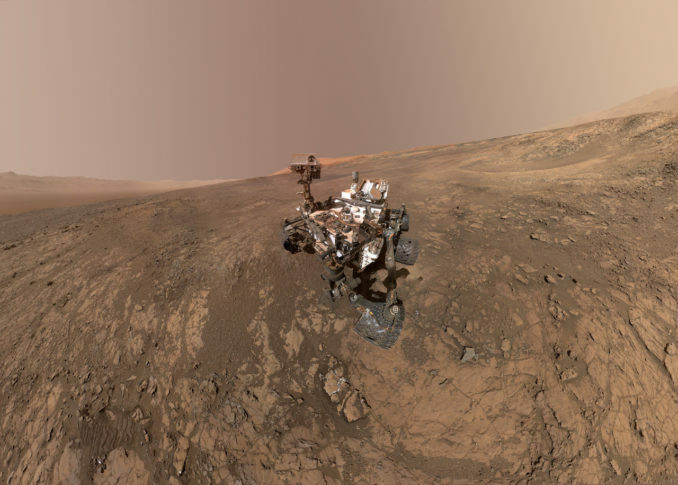 Approaching the sixth anniversary of its touchdown on Mars in August 2012, the Curiosity rover has driven nearly 12 miles — about 19 kilometers — climbing through geologic layers on the flank of Mount Sharp, a three-mile-high (5-kilometer) peak at the mission’s Gale Crater landing site. Observations by the rover’s other scientific instruments, including its rock-zapping laser, brush, weather sensors and cameras, were not affected by the temporary loss of the drill. 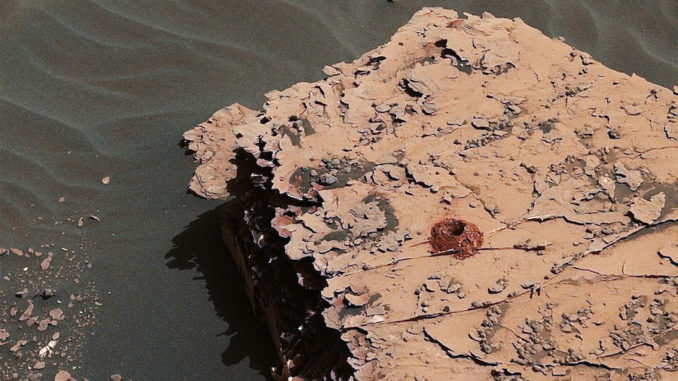 Curiosity reversed course to find a suitable location to drill last month, eventually finding “Duluth,” a block of rock in a geologic layer dubbed “Blunts Point” just below “Vera Rubin Ridge,” which harbors minerals that formed in a wet environment on ancient Mars.